A radioisotope and its imaging have been powerful tools to explore the mechanism of chemical reaction and the dynamic behavior of trace element in biomolecular science and nuclear medicine. 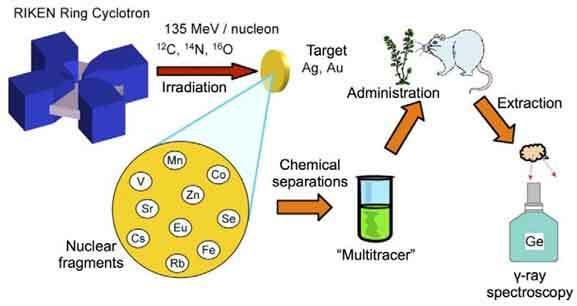 This article reviews some labelled compounds for radiopharmaceuticals in biochemical science and nuclear medicine using short-lived nuclides, the production and applications of “Multitracer” containing carrier-free radionuclides of more than 50 elements and a new radioactive tracer technique coupled with simultaneously imaging of multiple molecules labelled by γ-emitters. In addition, X-ray phase imaging and microscopy technique using synchrotron radiation are introduced. Radioactive tracer, Labelled compounds, Nuclear reaction, Nuclear fragment, Multitracer, Carrier-free, γ-Ray emission imaging (GREI), α-Emitter, Phase-contrast X-ray imaging, Synchrotron radiation. The University of Electro-Communications, RIKEN Nishina Center for Accelerator-Based Science, 1-5-1 Chofugaoka, Chofu, Tokyo 182-8585, Japan.